This Friday, the Institute of American Indian Arts in association with the University of New Mexico’s Art, Research, Technology & Science Laboratory (UNM ARTS Lab) will present the culmination of years of research in interactive immersive digital art in the digital dome. 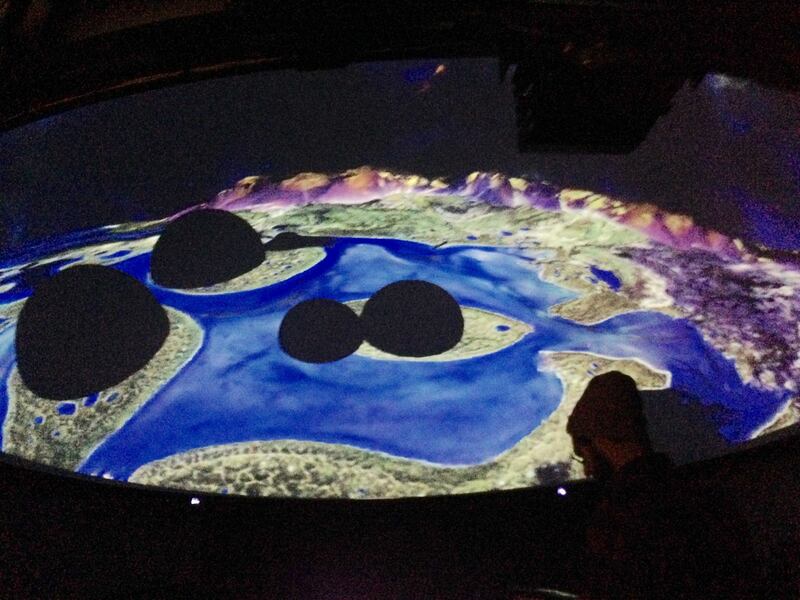 Utilizing vDome, a custom made software and hardware configuration created at IAIA, artists and students came together to create the first immersive interactive gaming art for the digital dome (aka fulldome). The event will take place Friday, January 30, 7pm to 9pm. Tonight’s Interactive Dome Event at IAIA is POSTPONED due to the weather. The new date is Friday, February 6, 7pm to 9pm. This event will feature work by Woody and Steina Vasulka and the 4th Movement of “Ursonate” by Dada/Intermedia artist Kurt Schwitters as performed by Jack Ox and Kristen Loree. Other work will be featured by Ethan Bach, Luke Balaoro, Robert Drummond, Felicia Nez, Erin Schaefer, and Craig Tompkins. Presentation by researchers David Beining, Jane Crayton, Mats Reiniusson, and Charles Veasey. In 2012, the Institute of American Indian Arts announced the receipt of a $573,321 research grant from the Department of Defense entitled Fulldome Development for Interactive Immersive Training Capabilities. UNM ARTS Lab acted as sub awardees on this research. The research project was built on an existing partnership between IAIA and UNM ARTS Lab. IAIA was one of two sub awardees, the second was Santa Fe Complex. In this 2010-2012 National Science Foundation Partnership for Innovation (NSF PFI) grant to the University of New Mexico (UNM) entitled A Consortium for Fulldome and Immersive Technology Development”. The research developed from this grant provided new context for fulldome in terms of usability, diversity of content, and accessibility. The funding provided the resources necessary to create one of the first single computer user friendly, multiple application dome systems. This software, vDome, can drag and drop play large format dome masters as .mov files with slicing on the fly; allows for connecting various applications including Max/MSP and Vjing software along with external sensors for audience driven interactivity; and allows for gaming in the dome. This software is open source and be downloaded from github. Read more about vDome. The IAIA DoD grant provided courses and month long paid hands on learning internships for students from IAIA and UNM. IAIA students are currently working in dome production. Students learned skills that fostered in creative, intellectual, technical, and self-esteem building development. To produce something for the dome was no small feat, but previous to vDome students also had to learn to write programming language in order to get their stuff to play or hand their work over to someone else to play it for them. vDome allowed students control over their own content in the dome and not just in the computer lab. For more information regarding the progress of this grant and documentation of some of the research, please see the BETA blog research and UNM ARTS Lab Blog.